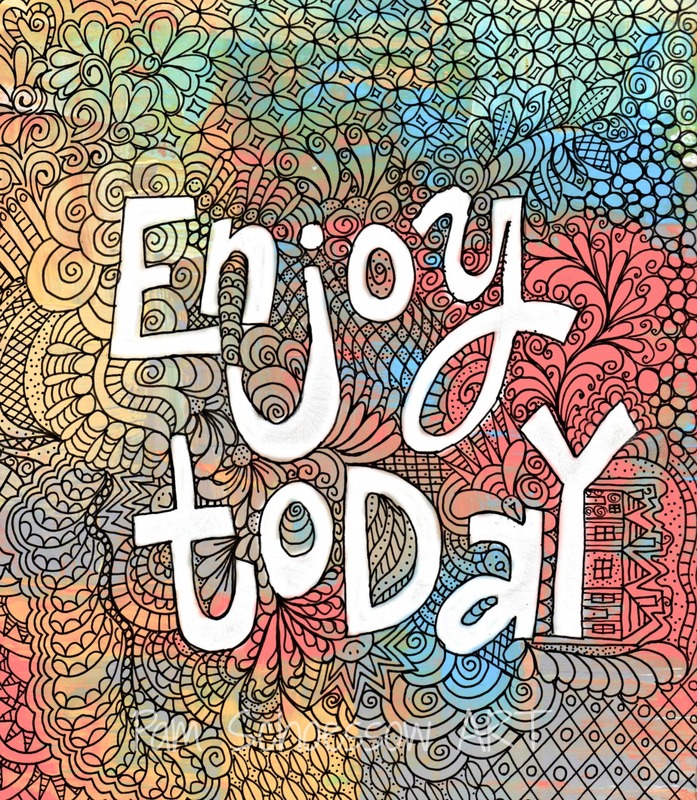 I felt like drawing today. This started as just a black on white doodle. 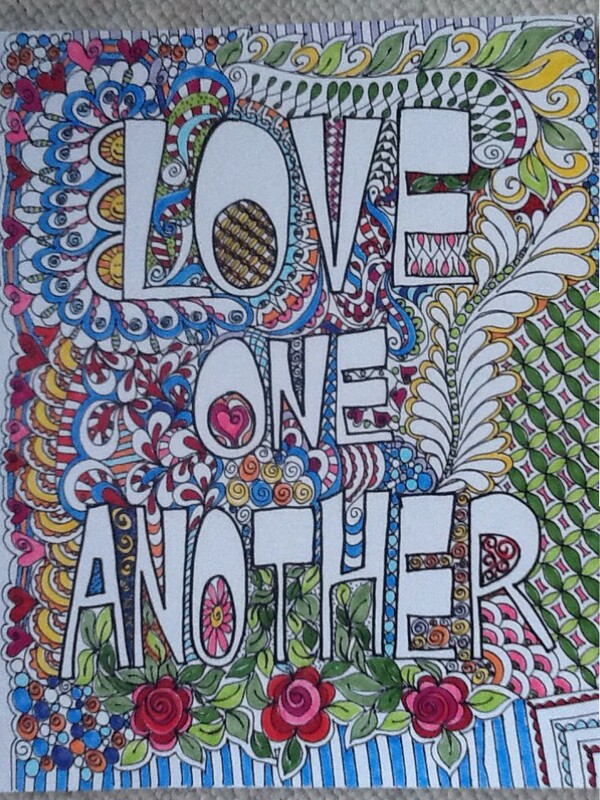 I discovered how to add some color in PicMonkey. It’s needs to be cleaner, but it’s a start. One of my goals is to do more art on the computer. 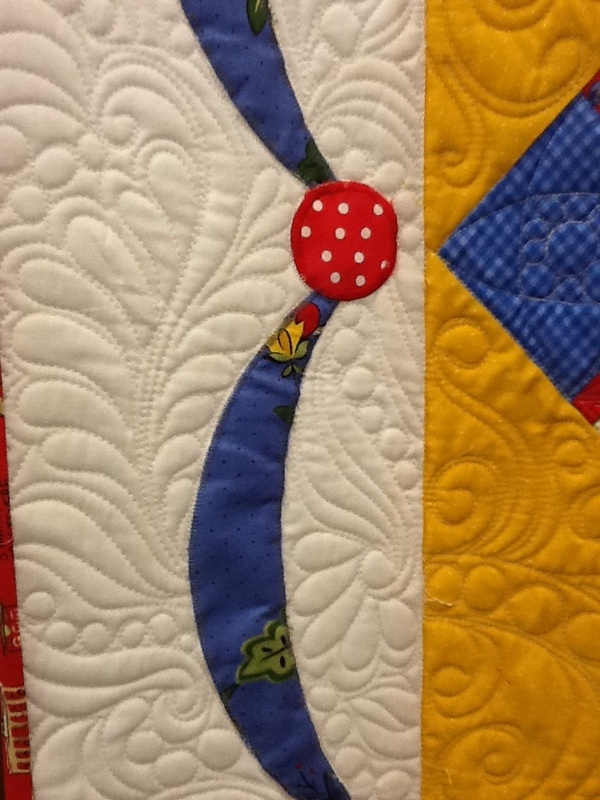 I thought I would share a few more pics of my quilts that were in the show last week. First is one I call French Baskets. The blocks were made by friends in my guild for my birthday. 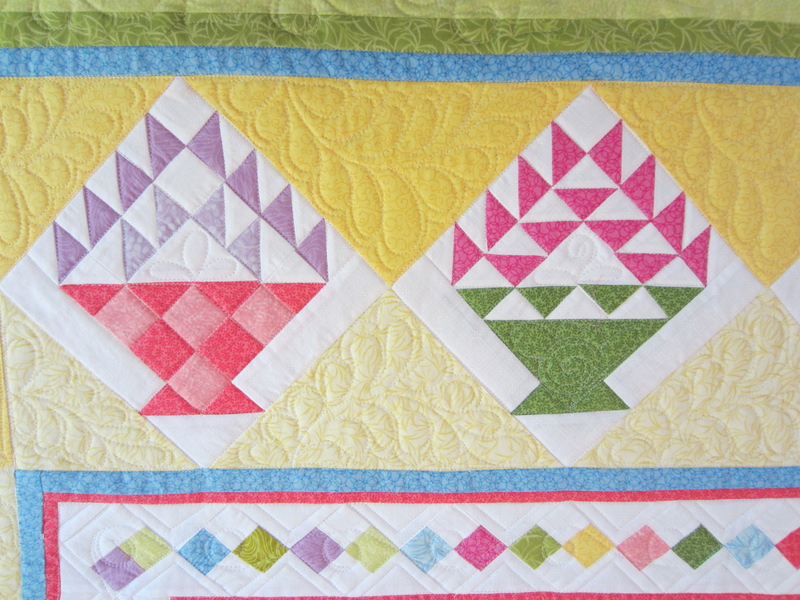 When I was deciding how to make them into a quilt top, I found this great fabric (sashings and border) in my stash. 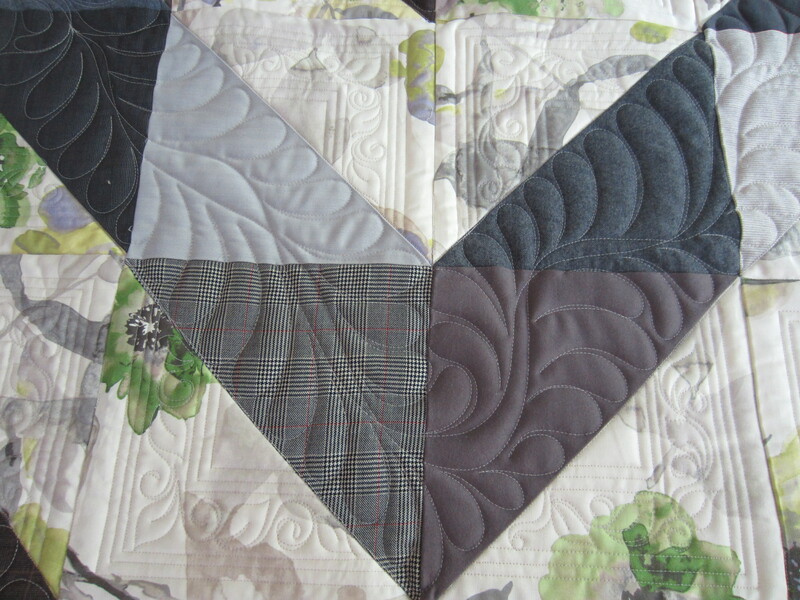 I was so proud of myself for using fabric I already had! 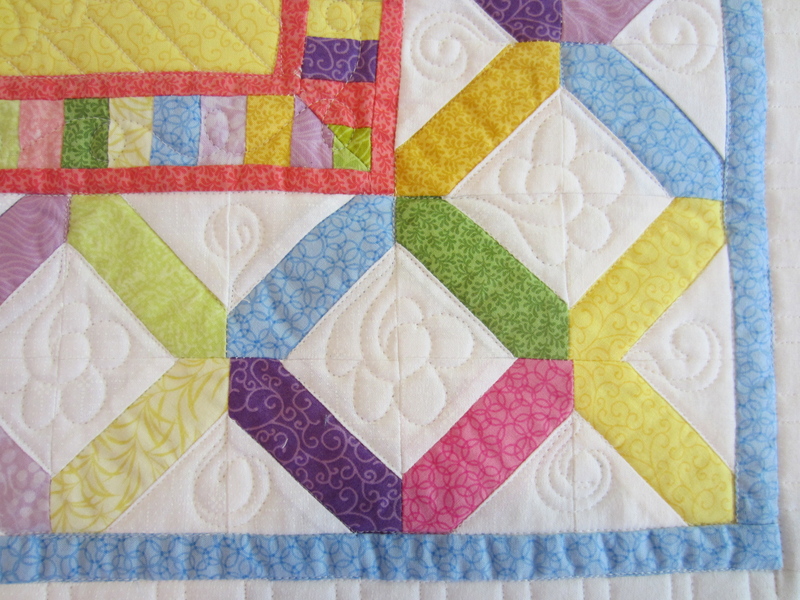 I designed the swag appliqué on the sides because I didn’t have enough of the striped border fabric to go all the way around. I really like how it turned out. 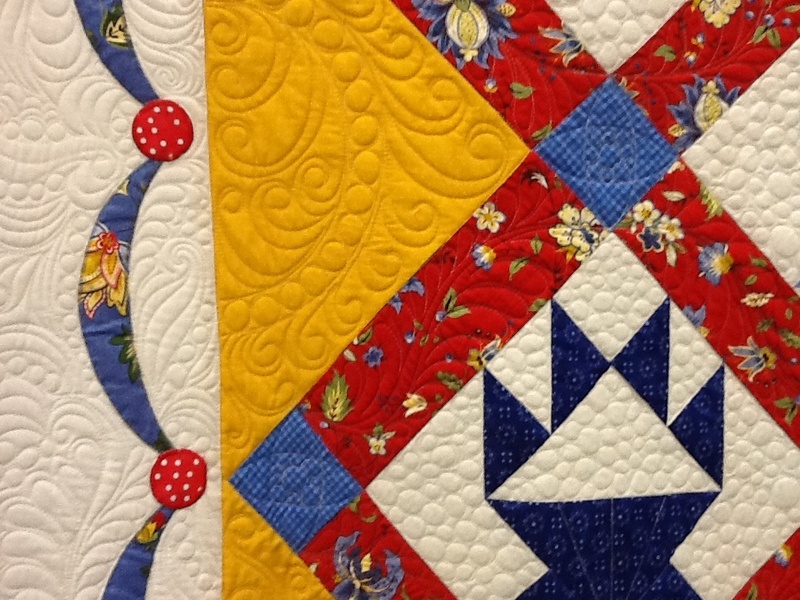 The primary color scheme is reminiscent of French Provance. 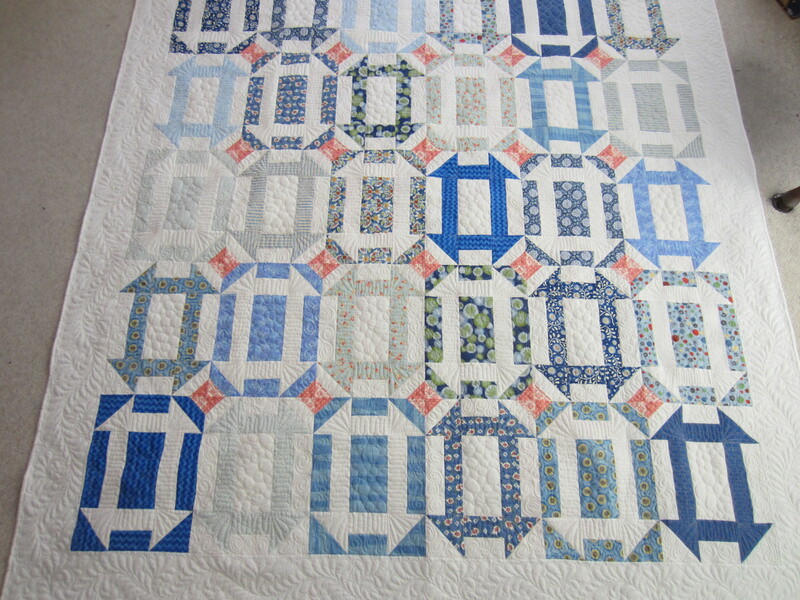 For the back, I incorporated a vintage tablecloth I got off of eBay that had the same colors. 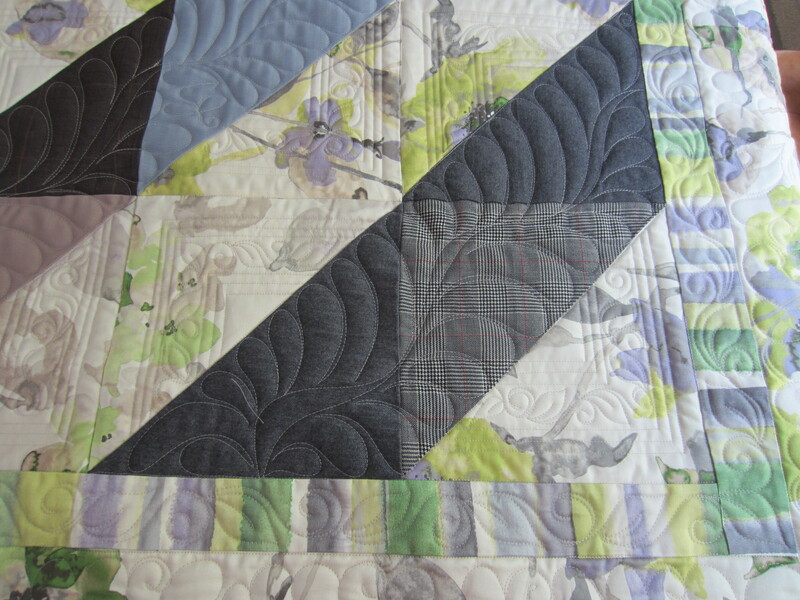 Then I did some fun free motion quilting. 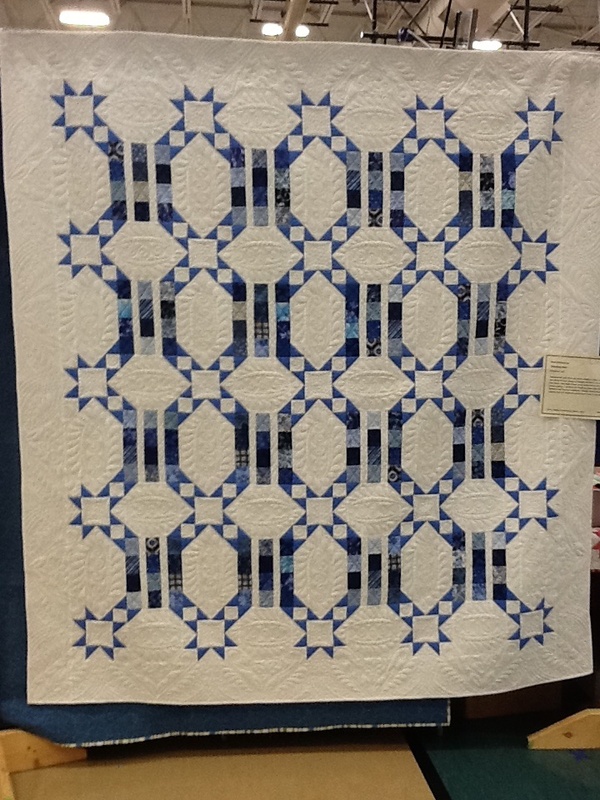 Also in the show was a quilt that I designed and made for my son Scott’s wedding to Robyn (I’m ashamed to say how long ago that was–but it took we a while to finish). Now that it has been in the show, I can no longer come up with any more excuses not to hand it over to them! 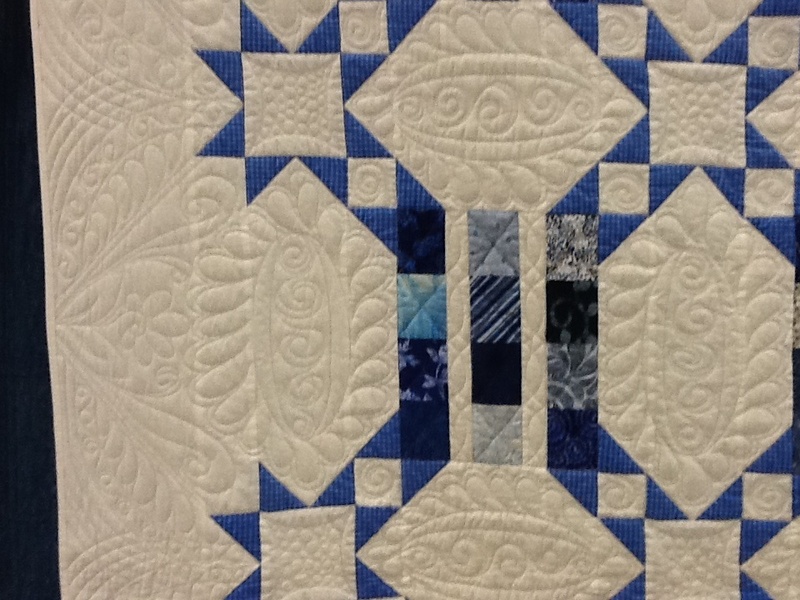 The color scheme is a traditional blue and white, but I was sure to leave a lot of negative space for quilting. 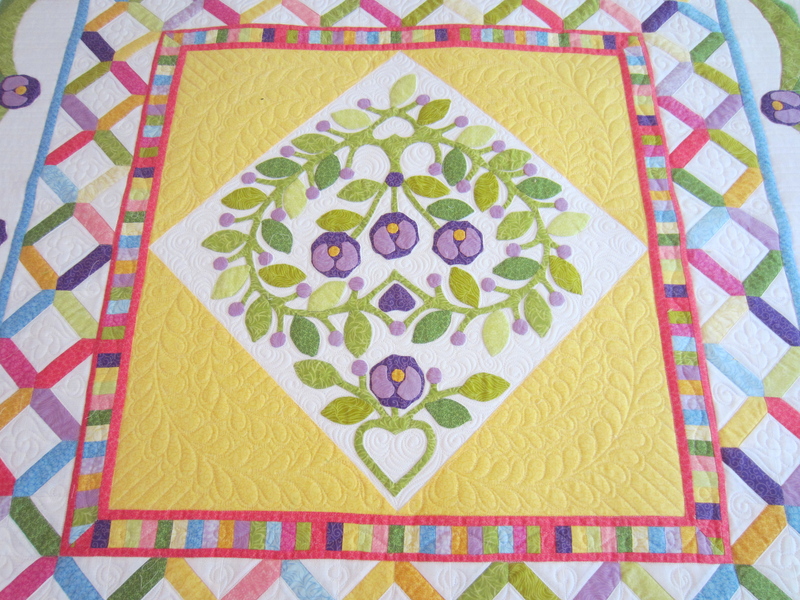 The last several weeks I have been working on a wedding quilt for my niece, April. 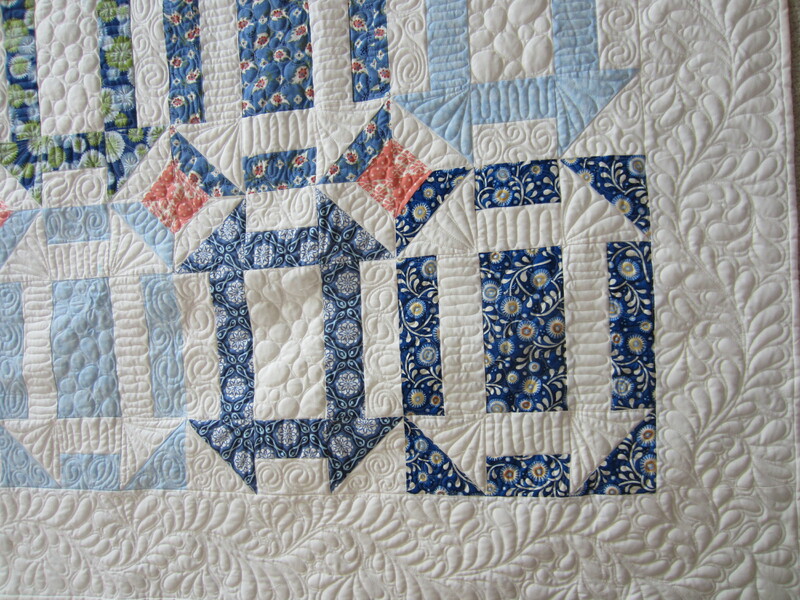 I finally finished just minutes before I left for the airport to attend the wedding in Las Vegas (my hometown). The wedding was last Saturday and everything was beautiful. Her colors were blue and salmon so I picked several blue prints and designed an elongated monkey wrench block. 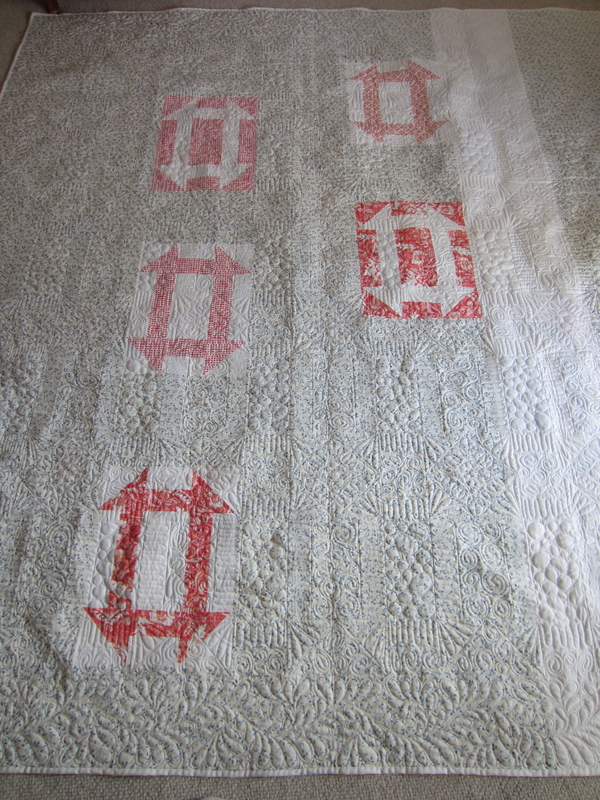 I didn’t want the quilt to be too “girly” so I just adding a touch of salmon in the corners of the blocks. 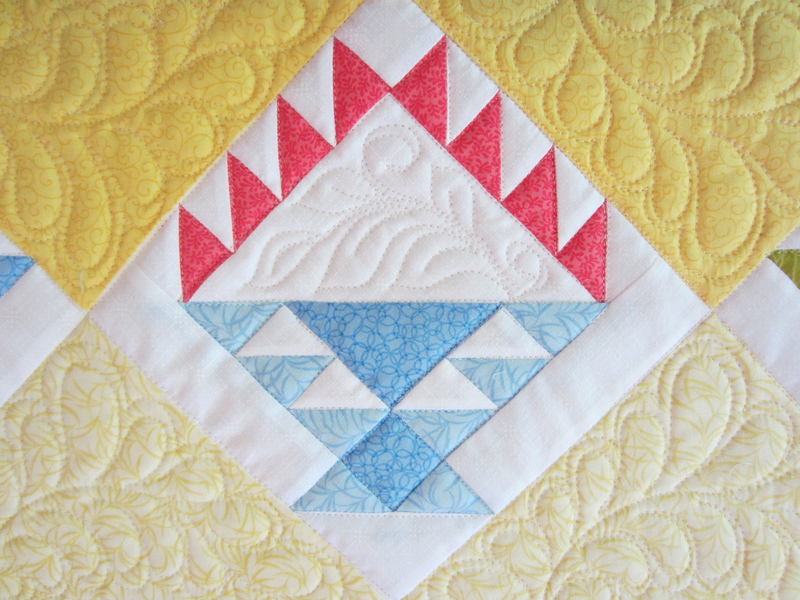 The few salmon blocks I did make became part of the pieced back. 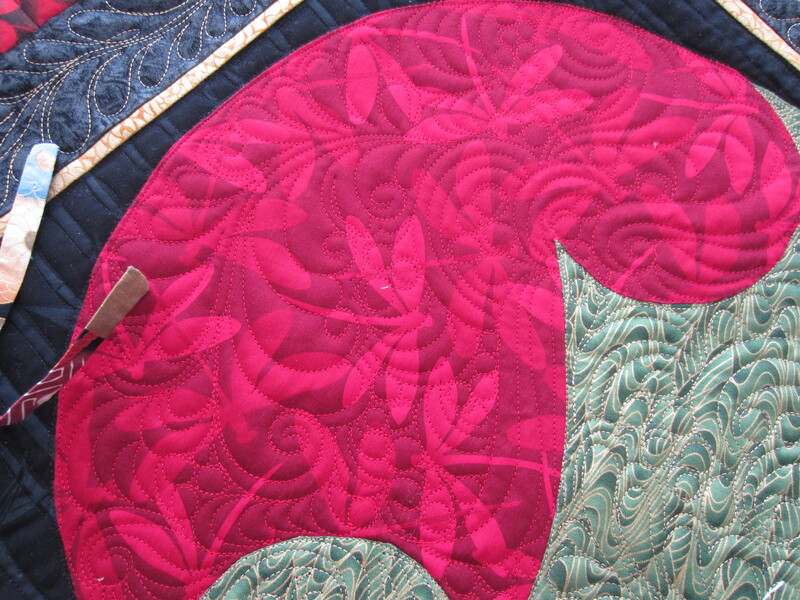 I quilted it with several different designs in the blocks and traditional freehand feathers in the borders. 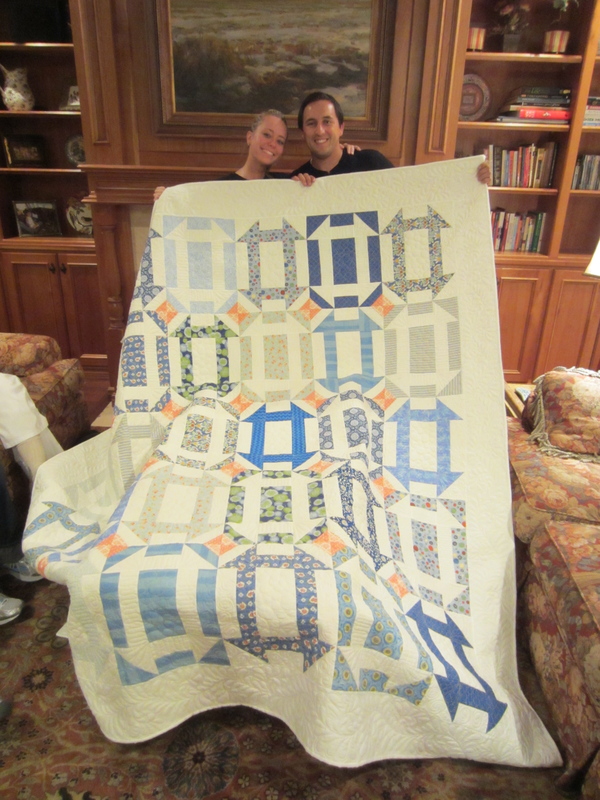 I presented it to the happy couple a couple of days before the main event. They seem very pleased with the results! 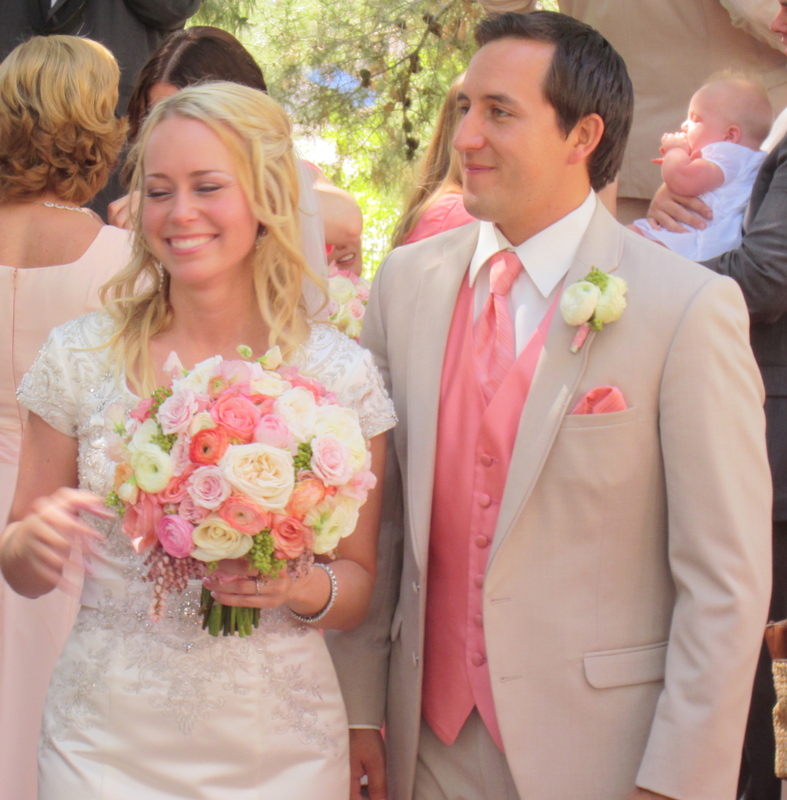 April and Brandon on their wedding day, August 17, 2013. Best wishes to the happy couple! 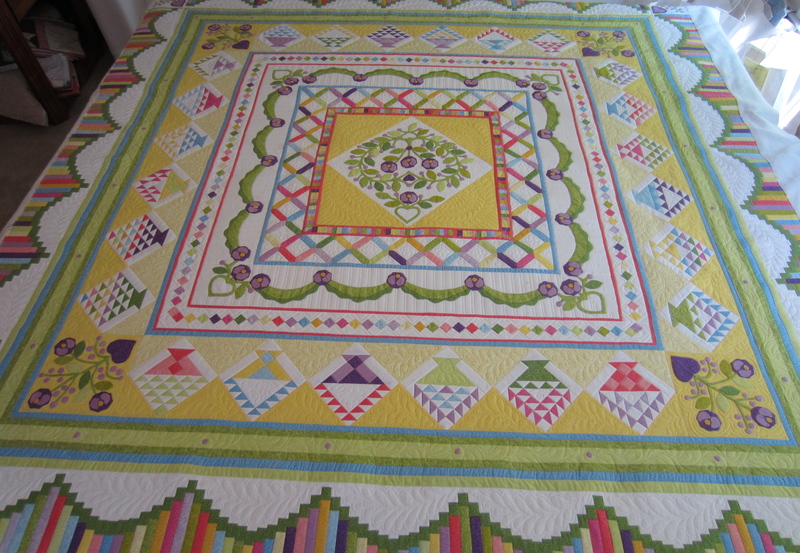 I know they will appreciate the quilt and that makes it all worth it. 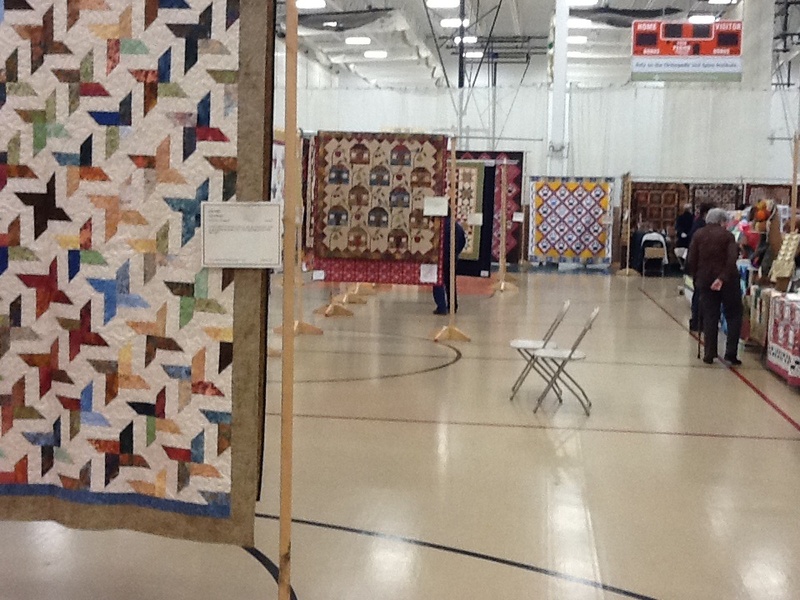 Sue wanted to honor her father by having a quilt made out of his old suits. 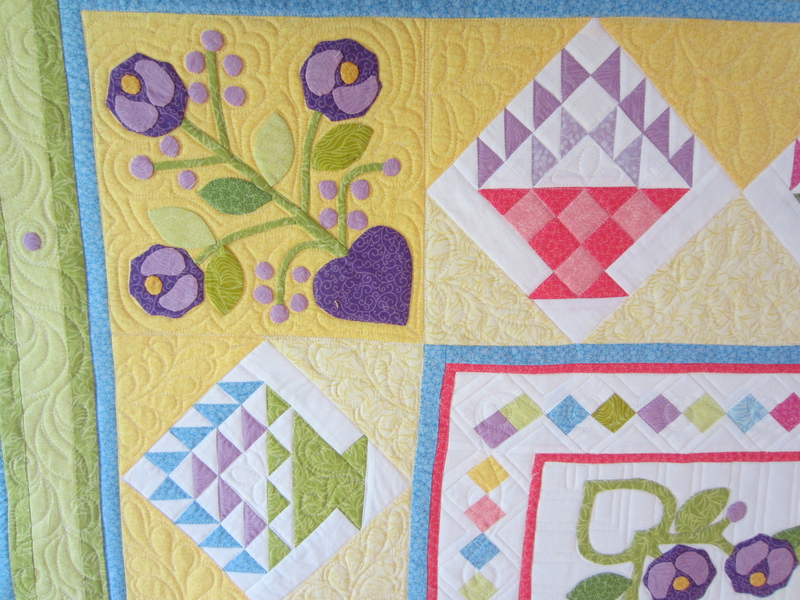 Her friend Brenda did a wonderful job piecing a quilt top that was very pleasing–adding a floral print that softened the look. 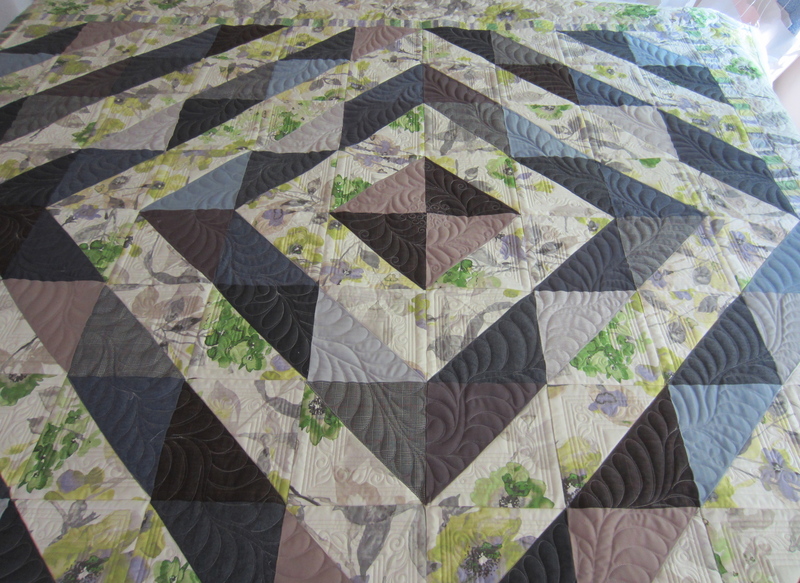 I recently finished quilting it. 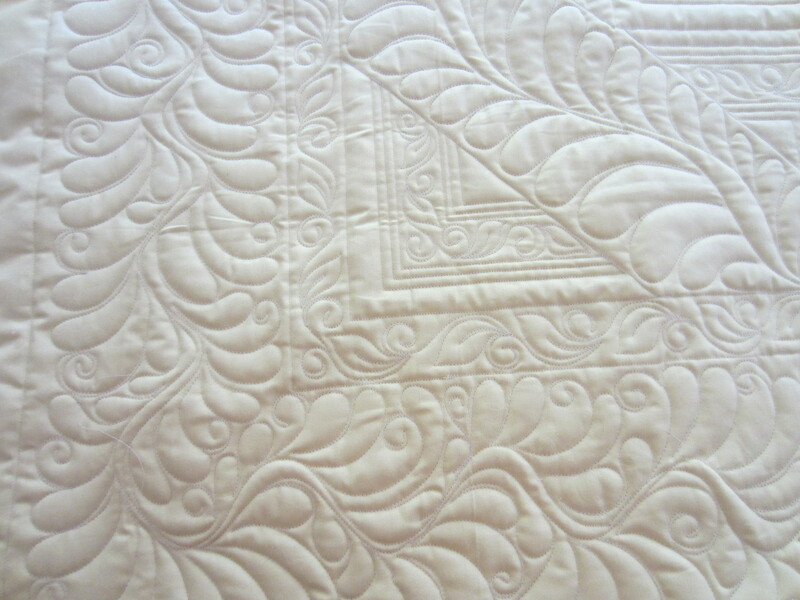 It’s a large bed sized quilt. 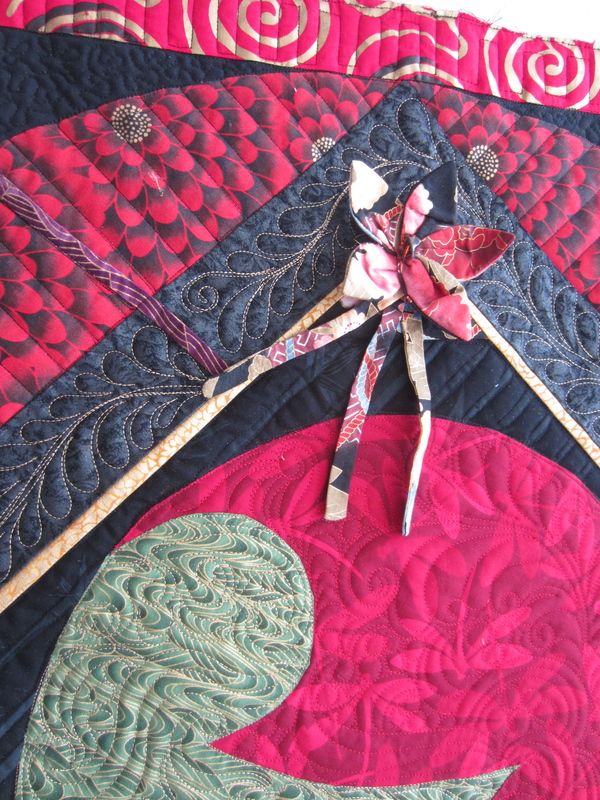 I quilted feathers in the “suit” areas to soften and unify the different wools. 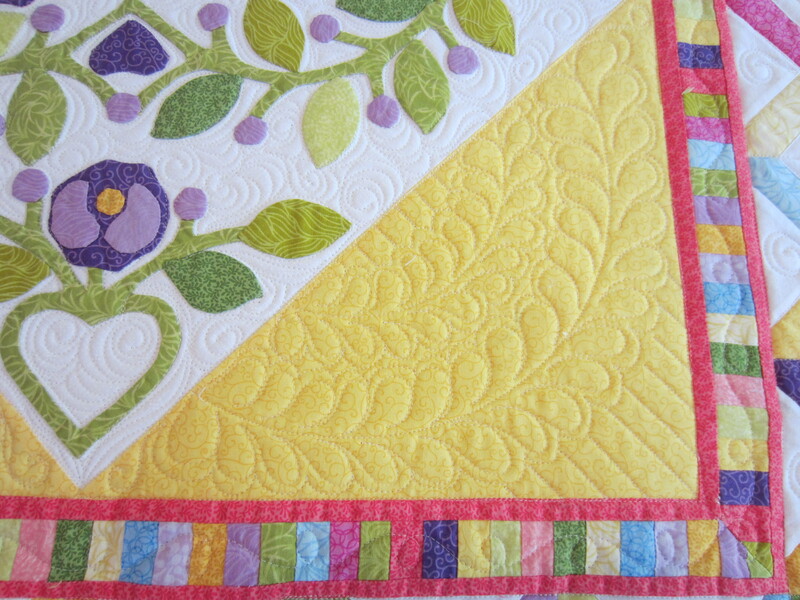 In the floral print, I used straight lines to accent the triangle shape and added some freehand leaves and curls. 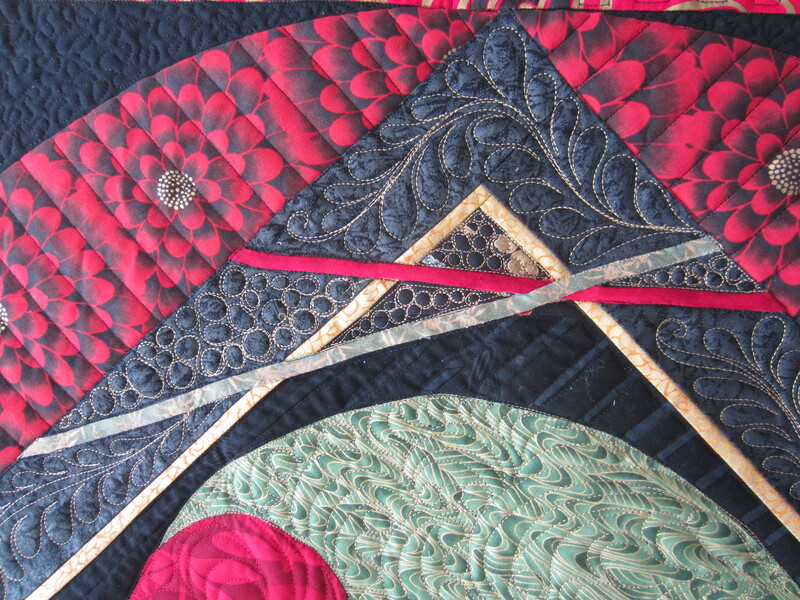 In the center, I quilted a feathered wreath. 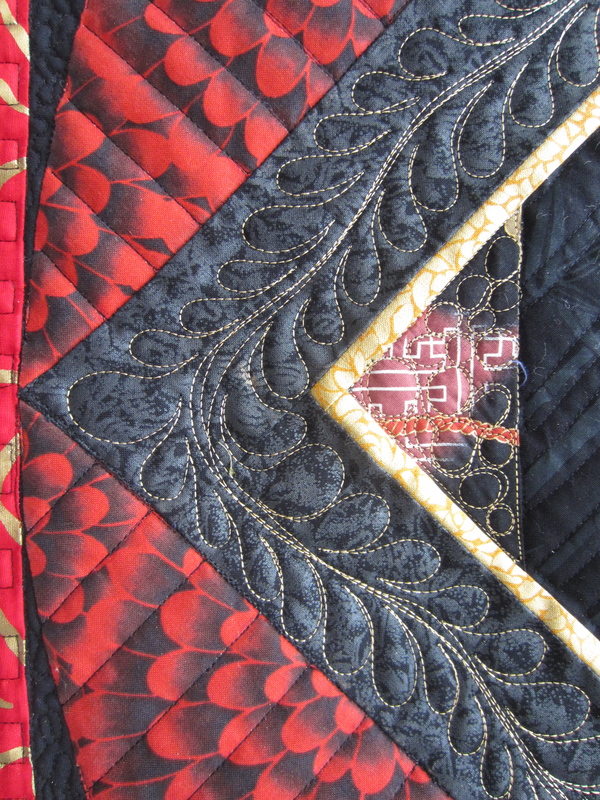 On the other side, it’s easier to see the border design. 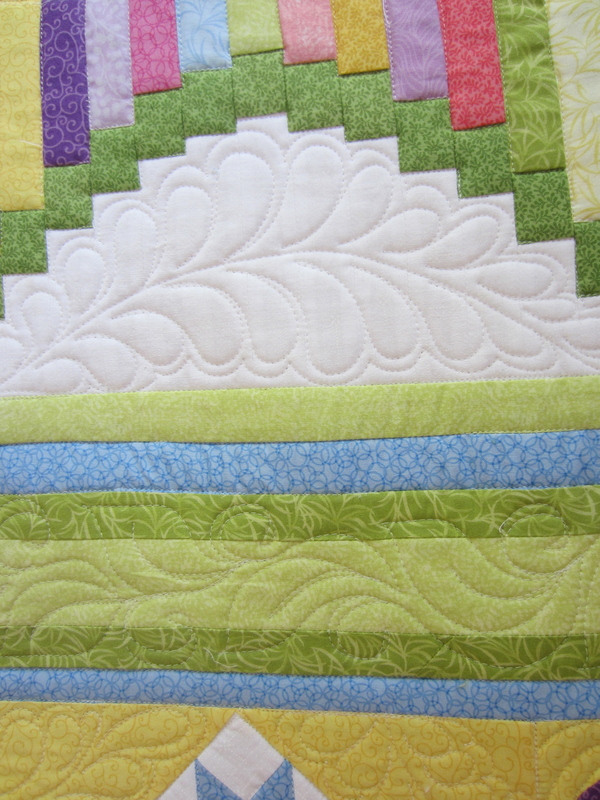 The solid lime green backing fabric really shows off the quilting. 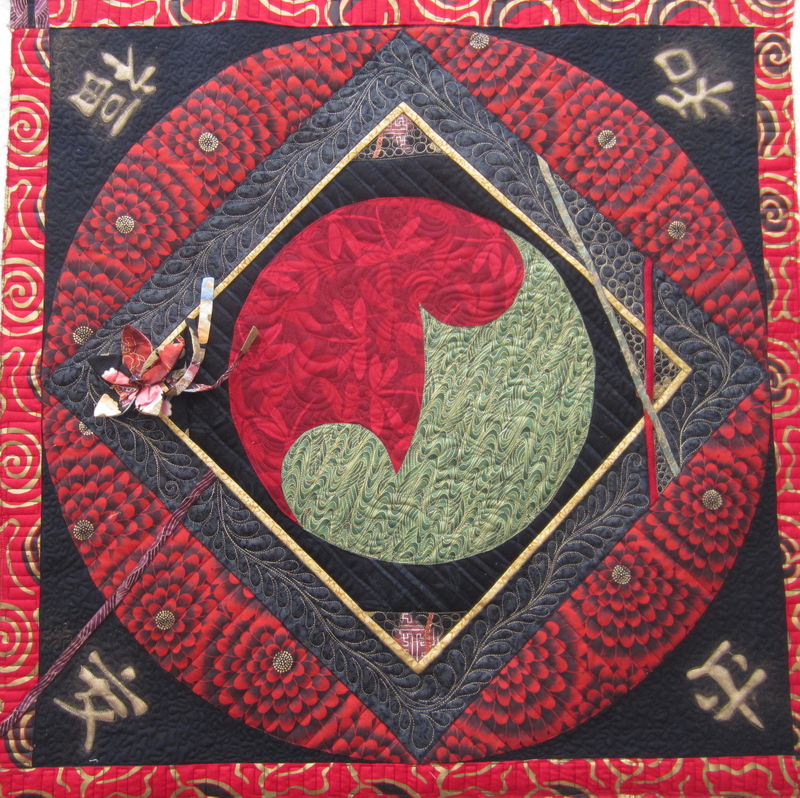 This is one of the those quilts that was really an honor to quilt. I love how it turned out. 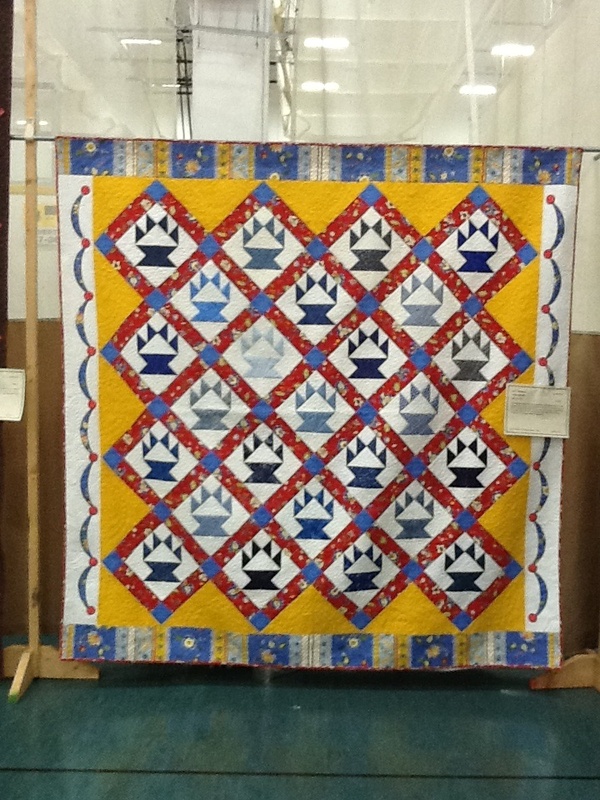 Here is an incredible quilt pieced and appliqued by Abby W. from New York state. She said it took a year and a half to complete the top. I’m not surprised. She did a wonderful job! 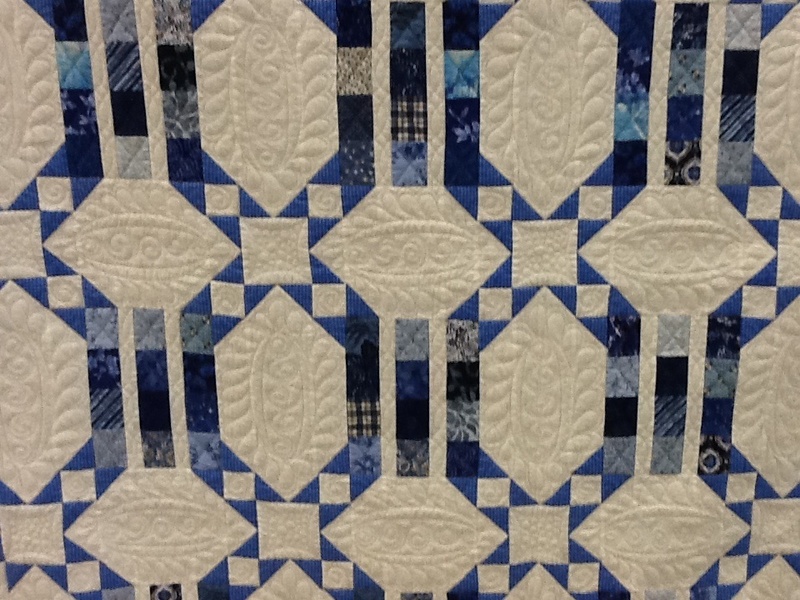 The pattern was a block of the month offered a couple of years ago on The Quilt Show (with Alex Anderson and Ricky Tims) on the Internet. 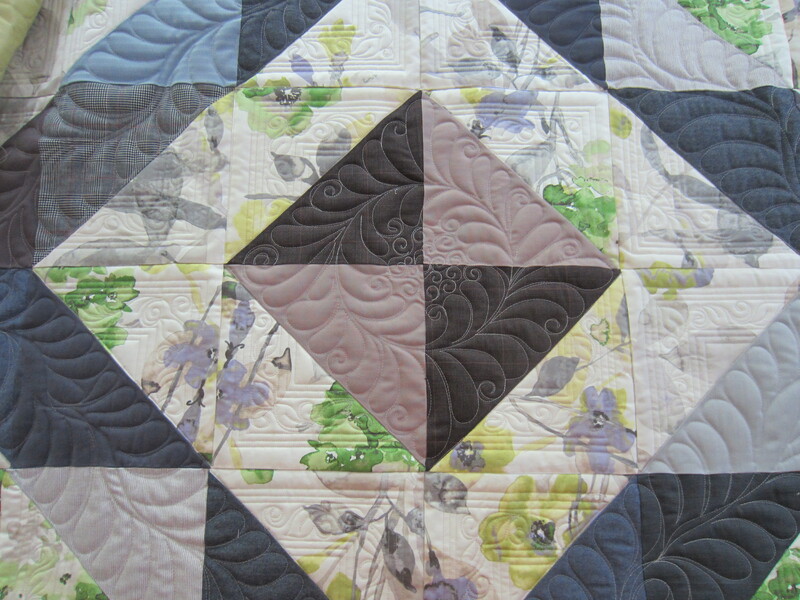 It was designed by Sue Garman. 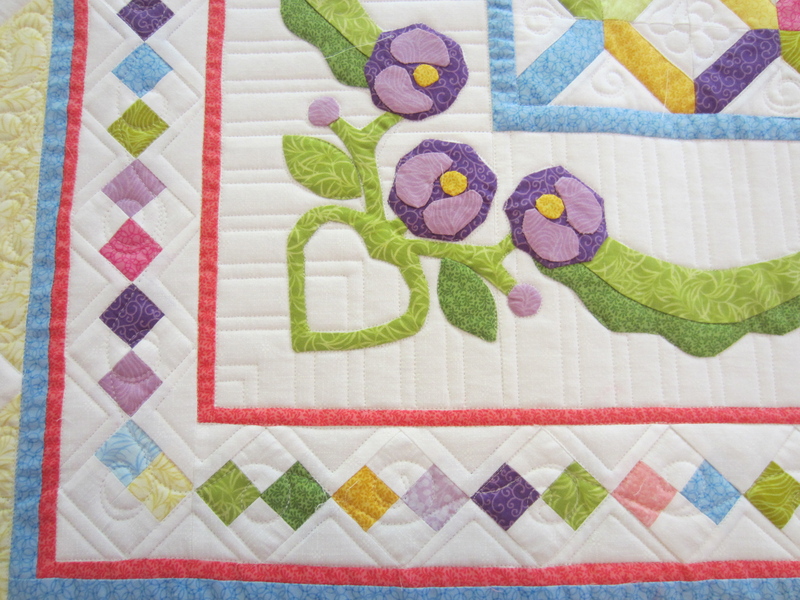 I did my best to compliment the top with combination of straight line quilting , stitch in the ditch, and freehand flowers, leaves and feathers. It took a while, but the results were worth it. 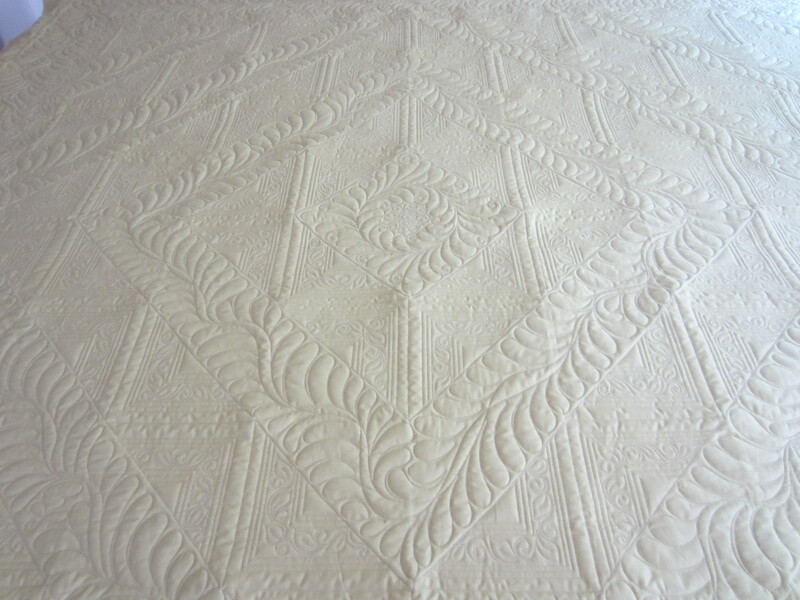 The back side (last pic) looks like a whole cloth whitework quilt!